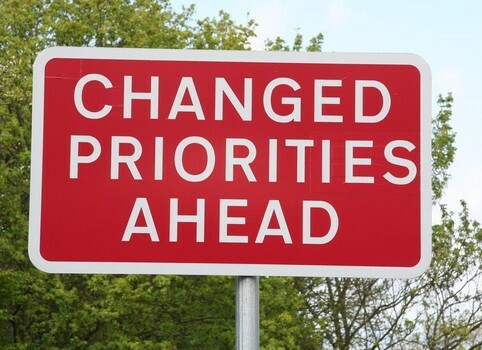 What are your priorities in life? Have you ever spent much time thinking about what you should spend your time on? Most people have not. They just go from day to day doing whatever they want and whatever they feel like doing, without ever really asking themselves what they should be doing. Which shows the truth of what one well-known businessman from California said several years back. He said that there are two things that are difficult for most people to do: To think, and to do things in the order of their importance.” What a tragedy it would be to have gone through your whole life and at the end of it, look back, and realize that you spent all your time, money and energy on things that were pointless and had no value or worth. How depressing it would be to realize that you had wasted your entire life on vain pursuits. So what should you spend your life on? Well thankfully, the Bible gives us many clear statements on how to have purpose in your life. What priorities to set for your life. There are hundreds of such statements in the Bible, but they all boil down to one thing. Here it is in black and white. Here is the bottom line on how to set priorities and how to live with purpose: Make eternal things priority. The television shows we watch. They won’t last. The knowledge we have about cars and sports, it won’t last. The wealth we accumulate in our 401(k) won’t last. The only things that matter are those that have eternal significance. Getting your name in the history books doesn’t matter if you fail to get your name in the book of life in heaven. Getting wealth on earth doesn’t matter if you lose all reward in heaven. What should our priorities be? We should focus on things that will last for eternity. This is what we see Jesus do in the last part of Luke 4. Luke 4:42-44 shows us that Jesus knew His priorities and purpose. Jesus knew what to put first and what He had been sent to earth to do. It is these things He focused on. Let’s look first at the priority He set for Himself. It is found in the first part of Luke 4:42. We see there that Jesus made His relationship with His Father a priority. Luke 4:42. Now when it was day, He departed and went into a deserted place. This would be Sunday, the day after the Sabbath. He has just had a tiring day teaching in the synagogue and confronting a demon possessed man. This long day was followed by an even longer night of healing the multitudes that came to Him. And now, according to Luke 4:42, when it was day, He departed and went into a deserted place. He went into a deserted place where there were no people. He went to get away from the crowds of people. This startles us at first. We often think of Jesus as being somebody who never needed a moment to Himself. Who constantly gave and sought out crowds of people so He could teach them or heal them. But this is not the Jesus the gospels reveal. Very frequently we read of Him going out into the desert to escape the crowds, going up onto a mountain to get away from the people, going into a deserted place like we read here. This wasn’t because He didn’t love people. He does love people. He loves all people. He always has time for people. He always gives sacrificially to people. But you see, Jesus realized something. He realized that people were not His number one priority. Oh sure, people were a priority, but they were not His number one priority. Certainly, Jesus came to bring salvation to the people of the world, that was His goal, but it was not His priority. Just as an example, flip forward to Luke 6:12. The day before Jesus makes his very important decision of picking the twelve apostles, rather than get a good night of sleep, He spends all night in prayer. “Now it came to pass in those days that He went out to the mountain to pray, and continued all night in prayer to God.” Jesus, whenever He faces an important decision, whenever He has just finished a long and grueling day, spends extra time with God. Why? Because He knows where to go to get reenergized. He knows that His number one priority is His relationship with God. Everything else is worthless until this falls into line. The number one priority of Jesus was His relationship with God, and so He spent lots of time communicating with God through reading the Bible and praying. All relationship development depends on communication. God speaks to us through His Word, and we speak to Him through prayer. You will never have a good relationship with God unless you spend lots of time in the Word and in prayer. Jesus shows us this, and there are many Christians and pastors throughout the centuries who have realized this as well. I heard a sermon several years back where the pastor was talking about prayer, and he said that he uses a prayer system of concentric circles. A prayer system that looks like a target. When he prays, he begins at the center, at the bulls eye, and works his way outward. And what does he put at the center? Himself. The next ring out is his family, then his church, then the community, then in the outer circle is the world. He has kind of made himself the center of his prayer universe. Isn’t that selfish? No, not when you think about it. He has discovered that until he is in a right relationship with God, he cannot pray for others. That’s why he prays for himself first. Not the selfish requests for more money and a nicer car and a bigger house, but the confession of sin requests, the requests for God’s will to be done in his life, the requests for the filling of the Spirit and the illumination of the Word. Have you ever wondered what to pray for yourself without being selfish? Pray Scripture. Some of the best Scriptures to pray is found in Ephesians 1:17-19 and Ephesians 3:16-19. There are several prayer requests in these passages that Paul prayed for the believers in Ephesus, and which we can constantly pray for ourselves. When we pray these things, it will put our ongoing fellowship with God front and center in our life. This is what Jesus did. When Jesus taught his disciples to pray, this is where He tells them to begin. Luke 11 is one place that contains this model prayer. In Luke 11:2, Jesus tells them to begin by glorifying God, and then move from that to asking for God’s will to be done. Then he instructs them to begin with themselves, and the confession of sin. We see something similar with the real Lord’s prayer in John 17. There Jesus begins praying for Himself in John 17:1. “Father, the hour has come. Glorify Your Son, that Your Son also may glorify You.” Jesus begins with Himself. And he continues to pray for Himself all the way through John 17:8. And then, moving out in concentric circles, starting with John 17:9, He begins to pray for His disciples. Those who were nearest and dearest to Him. 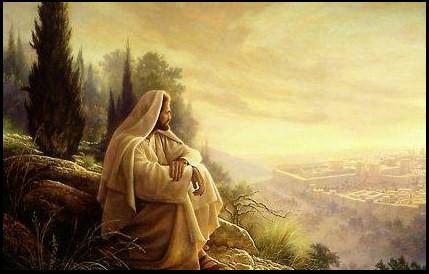 In John 17:20, he moves out further, and prays for everyone who would ever believe in Him. That includes you and me. Jesus prays for you. It is amazing to read what He prays for you, and I would encourage you to read it frequently in John 17:20-24. This all illustrates the point we have seen back in Luke 4:42. Jesus makes His relationship with God the Father His number one priority. Now if Jesus, being God Himself, needed to maintain His relationship with God the Father, how much more do we? Are you making your relationship with God your number one priority? Or is He lower on the list? Does God come after your favorite television show, and after your recreation at the lake, and only when you aren’t too tired? Where is God on your priority list? Put Him at the top. Nothing else in life will make sense until you do. There are numerous ways to make God a priority. But rather than give you a list of things to do, let me just boil it all down to one simple guideline. I’m a bottom line person, so let me give you the bottom line. Making God a priority simply means giving Him lots of time. You see, you can always determine what your priorities are by how much time you spend on it. If your children are a priority, you spend lots of time with them. If work is a priority, you spend more time at work than the average person. If sports and recreation are a priority, you spend lots of time in the woods and on the lakes. And whether you realize it or not, if you spend lots of time in front of the television, you are making it a priority. Now, you can’t really change how much you sleep or work, but the item that is last on the list should be at the top after sleep and work. But instead television is there at the top. Television is not something that will last for eternity, but far too many of us waste away our days and hours sitting in front of the TV. I’m not saying television is bad and you shouldn’t watch it. I watch television. I have some favorite shows. What I am saying is that it takes up far too much time in most of our lives. Television is too much of a priority. Now maybe you don’t watch much television. Great. But chances are that something else is filling your time that could be spent with God. So here is my challenge to all of us. I don’t want to overwhelm you, so wherever you are at with how much time you spend with God, move it up one notch. If you don’t read your Bible and pray very regularly, get on schedule where you spend at least five or ten minutes every day in the Word. If you do have daily devotions, try and make them ten or fifteen minutes longer. No matter how much time we spend with God, we can always spend more. So wherever you are at, just step it up one notch. When God is a priority, you spend lots of time with Him, in His Word, and in prayer. God should be number one. God should be at the top of the list. God should be your main priority. Another way to make God a priority, aside from spending lots of time with Him, is to discover why He put you on this earth, what His plans for you are, and then fulfill those plans. To discover what your purpose in life is and then fulfill that purpose. We see in the rest of Luke 4:42 and on into the first part of Luke 5, that Christ because of spending a lot of time with God, because Jesus made God His top priority, Jesus clearly and accurately knew what His purpose was, and set out single-mindedly to fulfill that purpose. We read in Luke 4:42b-44 that Jesus’ Purpose was preaching. We see first in the last half of Luke 4:42 that the crowds wanted to keep Jesus for themselves. And the crowd sought Him and came to Him, and tried to keep Him from leaving them. Jesus has gone off to spend time alone with the Father, and yet the crowds followed Him, and tried to keep Him from leaving them. The night before, He had healed all their sickness and cast demons out of people, and they realize, “Hey, this is the kind of guy we need to keep around. We won’t be sick any more. We won’t have doctor bills. We won’t need health insurance. Let’s do everything we can to keep Him here and help us with our needs.” But look how Jesus responds in Luke 4:43. Healing people is a wonderful thing Christ could have done. Feeding people for free is a wonderful thing Christ could have done. Casting out demons is a wonderful thing Christ could have done. But however wonderful these things are, Christ knew that if He focused on them, He would be neglecting the one thing God wanted Him to do – preaching the kingdom of God. And if He did all these other wonderful things, but failed to do the one thing God sent Him to do, it all would have been for nothing. When we fail at our God given purpose, we fail at everything. God sent Jesus to preach, and although there were many other good things Christ could have done, according to Luke 4:44, preaching is what Christ focused on. This was the purpose of Christ. The reason He was sent. The one thing God wanted Him to do. And according to Luke 4:44, this is what He did. He went from town to town preaching in the synagogues. Preaching was His God given purpose, and since God was His number one priority, doing God’s will was His number two priority. 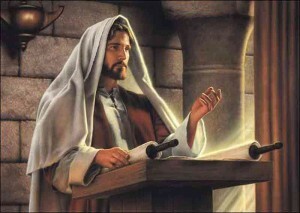 Jesus fulfilled His purpose of preaching in the synagogues. Remember, the synagogues were like our churches. It is where they local believers would gather on the Sabbath for services that often lasted all day long. Those who were able would also come on Monday and Thursday to hear the Word of God taught so that they could be trained and equipped to fulfill their God-given purpose. This is what the early church did too. The early church was so devoted to the teaching of the Word, that according to Acts 5:42, they met every single day to hear the preaching of the Word. Now that’s making God a priority! Have you ever wondered why the early church had so much power? One reason is that they made God a priority in their lives. Every day, they came to hear the preaching of the Word. They also came to be encouraged and equipped so they could go out and fulfill their God-given purpose. Each and every Christian throughout history has a God given purpose. It is not only Jesus Christ who has a purpose; God has given a specific purpose to every individual Christian the face of the planet. You have a purpose. I have a purpose. And until we discover what that purpose is, and begin to single-mindedly fulfill that purpose, life will seem empty and meaningless. Most of the early Christians, I believe, knew what their purpose in life was. And they knew that in order to fulfill their purpose, they needed to have as much of God and His Word in their life as they could possibly get. That is why they went every day to hear the preaching of the Word. So they could get instructed and encouraged in the Word. And once they had been filled, then they went out and emptied themselves by fulfilling their divine purpose. This was the secret and power of the early church. What is your God given purpose? Do you know? Have you ever thought about it? If it ever seems like your life is missing something, if it ever seems like your life lacks significance, most of this is probably due to the fact that you do not know what your purpose is. Jesus’ purpose was to preach. This was also the purpose of the apostles. As your pastor, I know that this is my purpose. But preaching is not everybody’s purpose. Each of you have a unique God given purpose which only you can fulfill. Each of your should seek to discover what that purpose is and live it. Life will not be complete until you do. If you want to know your God given purpose, you first have to know what good news He has for you. So, do you want to know your purpose in life? Make God a priority. In 1963, the University Christian Church in New York closed their doors never again to reopen and put a sign on the door which said, “Gone out of business … because we didn’t know what our business was.” If a church is going to succeed, it needs to be filled with people who know their business – who know their purpose in life. Billy Sunday, that great baseball player turned evangelist said that more men fail through lack of purpose than lack of talent. Each and every one of us has talent and gifts and abilities. But we waste them and fail at life because we lack purpose and priorities. Jesus knew both His purpose and priorities, and so completely fulfilled God’s plan for His life. My prayer for each of you is that you will discover what your purpose is, and will make the necessary adjustments in your priorities to fulfill that purpose. I am so blessed today because things have been made much clearer to me. From now my number one priority is my relationship with God. Thank you very much sir I am reading this from Liberia West Africa. I count it a great blessing to me to be reading message like in such a time like this when I was thinking about how to fulfill my divine purpose on earth. I found this article while researching information for a sermon. I an using all the information here and adding some to it. Thank you, it was well written and a blessing. In the country where I live, statistically, 50 people every week take their own lives. Of course they are not just numbers, they are people, many very young, tragically gone. People who apparently have lost purpose in life. I think that we need to make sure that we talk to people, be Christ to people, not hit them over the head with deep theology or shove a list of proof texts under their noses. If we understand purpose, then when we meet those who are faltering and despairing, shouldn’t we talk about it in sympathetic and persuasive terms. Jesus did. If only 50 people a week could hear about God’s purpose of redemption and their purpose of being living children of the Kingdom of God. Yes. Many of us Christians just go around condemning people and quoting Bible verses at them. This is not what they need. They need us to love them and be friends with them. This is how we live and act like Jesus in the world. Jabu. This is a fulfilling and encouraging sermon reminding us why we were sent to this planet earth. I am so touched by this and will share it with as many people as I can. I will make it a part of my life not only when at the pulpit, but every time I meet somebody. There is more of a pulpit outside the church walls with more souls crying to here and receive the Word. Amen. Amen. I am blessed. It would be my references for my preaching. SO BLESSED! May God will bless you. Thanks,I just happen to come across this article and felt eased and comfortable. .I read it from Kiribati actually at the right time for me while searching for references and advices about life purpose priority. ..now I know. . Thank you very much for this Bible exposition. True, more men fail through lack of purpose than lack of talent. I am an example. This is splendid. I have made up my mind to go through this message over and over until it becomes part of me; by so doing, l will not struggle to share it with others.